what happens when you pair thirty-five strangers with deep expertise in disciplines ranging from Classical Chinese literature to biophysics, give them ninety minutes to make something strange, bold, and new, and ask them to present the results? 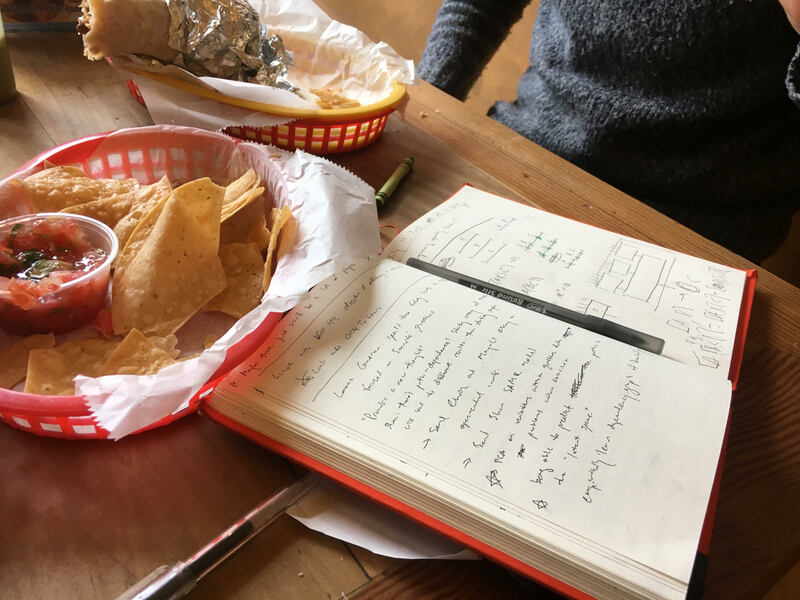 What's a notebook full of symplectic topology doing next to those nachos? A month ago, we decided to find out what would happen. I collaborated with the wonderful residents of Topos—Sebastien Zany, Sasha Targ, Nate Sauder, Vrushank Vora, and a member who would like to remain anonymous—to design and host the event we called an antidisciplinarathon. A discipline is an area of comfort and expertise; an antidiscipline is an area of curiosity, ignorance, boredom, or fear. We wanted to pair people who had complementary disciplines and antidisciplines and see what they could create. When I think about the "space" that we’ve created, I like to think about a huge piece of paper that represents "all science." The disciplines are little black dots on this paper. The massive amounts of white space between the dots represent antidisciplinary space. What does "all science" look like? Bollen et al. 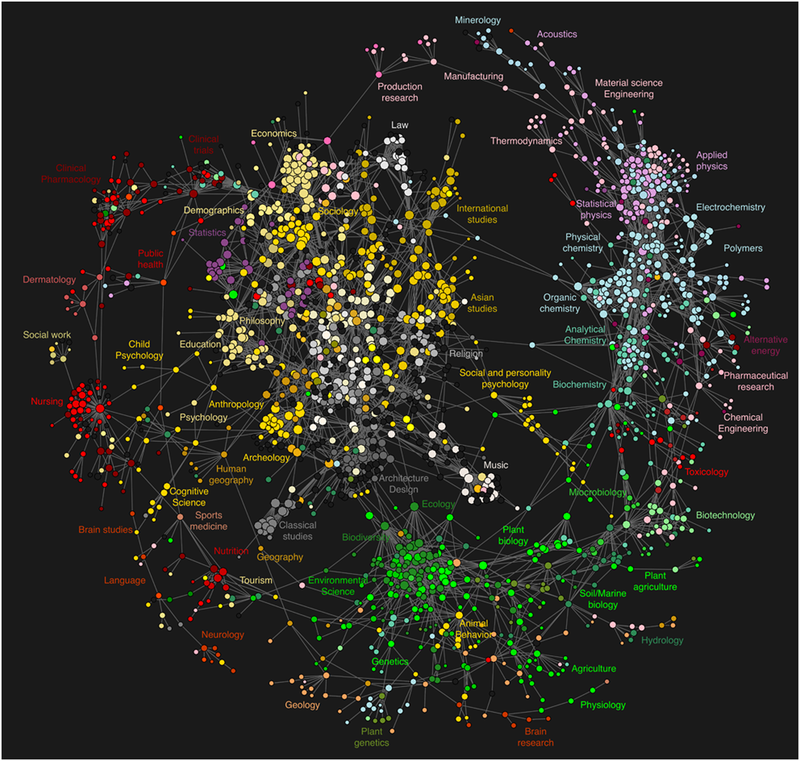 creates a map of science using users' clickstreams through citations. We thought there could be great potential for transformative work in pairing people carefully. For example, according to the paper "Atypical Combinations and Scientific Impact," many of the most cited papers lie in atypical "antidisciplinary" spaces. 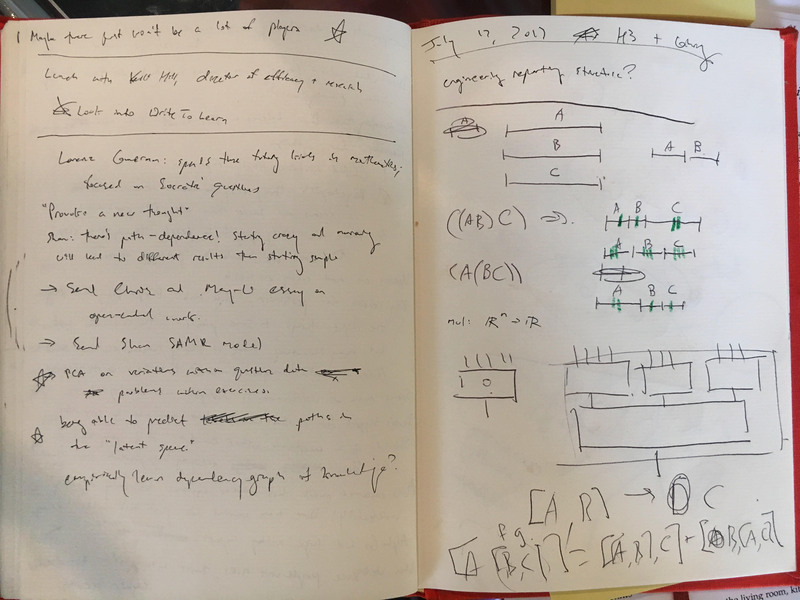 In the long term, we hoped to collectively spark an idea as good as some existing work that I considered impactful and antidisciplinary, such as the papers "Can a biologist fix a radio?" and "Could a neuroscientist understand a microprocessor?" Will you create a paper abstract, a drawing, a proof, installation art, performance art, a dance, an idea for a study, a real experiment, a tiny tool, a zine, an idea for an open problem to tackle, a proposed solution to a problem, a demo of a prototype, or something we couldn’t have imagined beforehand? You might stumble on a line of research that you—or someone in the audience—could work on for years. The idea for the antidisciplinarathon arose from hearing about some events similar in spirit, as well as from my frustration with the inefficiencies of the typical conference model1. I was indirectly inspired by the Rhizome 7-on-7, the Depth Jam, and an event described in this tweet by Ingrid Burrington. ...though our event is rather more well-documented. First, we (the Topos residents) drew up a list of Bay-Area-based friends and community members to invite. We aimed to create a group of attendees that was diverse in both discipline and mindset. The makeup of our attendee list was necessarily shaped by each of our communities of expertise: mainly biology, genomics, the science of aging, programming languages, mathematics, deep learning, art, and design. We asked each invitee to answer two questions beforehand: "What do you consider your disciplines?" and "What do you consider your antidisciplines?" Next, after thirty RSVPs had rolled in, we met two days beforehand to design the event, write a list of prompts, pair attendees, and do a trial run ourselves. When we could, we tried to create "strong matches" of attendees whose disciplines and antidisciplines were perfectly complementary. However, some antidisciplines were more in demand than others; for example, many people wanted to learn about (or were scared of) architecture and philosophy, but we didn’t have any architects or philosophers in attendance. Beforehand, I also had a lively discussion with Robert Ochshorn and Michael Nielsen about the foundations of the event—on the merits of doing antidisciplinary work itself—in which they gave us tremendously helpful critique. Robert took issue with the assumption that one can simply throw a dart at the "white space" between disciplines and hit a bullseye. Michael reminded us that many disciplines exist for a reason: they are organized around core insights, so antidisciplinary work done by people who haven’t mastered those insights is often "rather tepid." You can find the text of our conversation in the appendix. We explicitly encourage depth over breadth. We also encourage bold, experimental, illegible, or exploratory work over work that you don’t feel strongly about. A resident of Topos kicked off the event by telling us about how previous antidisciplinary collaboration at Topos had changed her and Sasha's lives. The person who spoke works on the biology of aging, and Sasha works on computational genomics. After new folks with deep learning expertise moved in for the Topos residency, both of them became interested in deep learning, started collaborating with the residents, and began using deep learning techniques in their research. Then, participants found their partners and went off to work. Thirty-five people showed up; some who had RSVPed couldn’t made it, and some came who hadn’t RSVPed. Thus, some folks were re-paired by the whims of chance and time. There were sixteen groups total: fourteen groups of two and two groups of three, with the five hosts facilitating brainstorming. What questions in your field have been bothering you lately? What small problems were you struggling with yesterday? What are you really good at? What immediately comes to mind when naïvely combining your skills? Try iterating on that. What are some of your favorite papers or pieces of art? Why? What is your "list of ten problems" (à la Hamming) that you carry around in your head, that you really wish you could solve? What really scares or surprises you about your partner’s field? What’s one implicit methodology or mindset in your field that you could use or challenge? What insights form the core of your discipline? "Make the familiar strange; make the strange familiar." Try to keep three parallel and distinct threads of ideas going. Try swapping between them, and see how you might combine them at the end. What was it actually like to make something under time pressure with a stranger? From our brief trial run while designing the event, I found it to be pretty scary! I had to consciously repress my oh-no-I-know-nothing-now-panic reflex in order to listen carefully to my partner, figure out what their unfamiliar jargon meant, damp my own use of jargon, and tease out our common interests and structural similarities in our suggestions. For example, when talking to Sasha, I didn't know what an EEG, MRI, or BCI were. I eavesdropped on some conversations at the event. Most groups seemed to start off with a relaxed conversation about their interests, then list deeper commonalities in their fields, then (as the ninety-minute mark neared) scramble to combine commonalities into a concrete idea. One researcher told me that his research group frequently held similar idea jams, yet he still found this process to be scary and challenging. I also helped facilitate some of the collaborations. In many cases, the ideas that people started out with differed substantially from the ones they ended up presenting. In some cases, I was able to jumpstart people who were stuck because I already knew their backgrounds, and was able to suggest past work they had done that might be relevant. After time was up, we served dinner, then began presentations. The presentations were wonderful to experience. 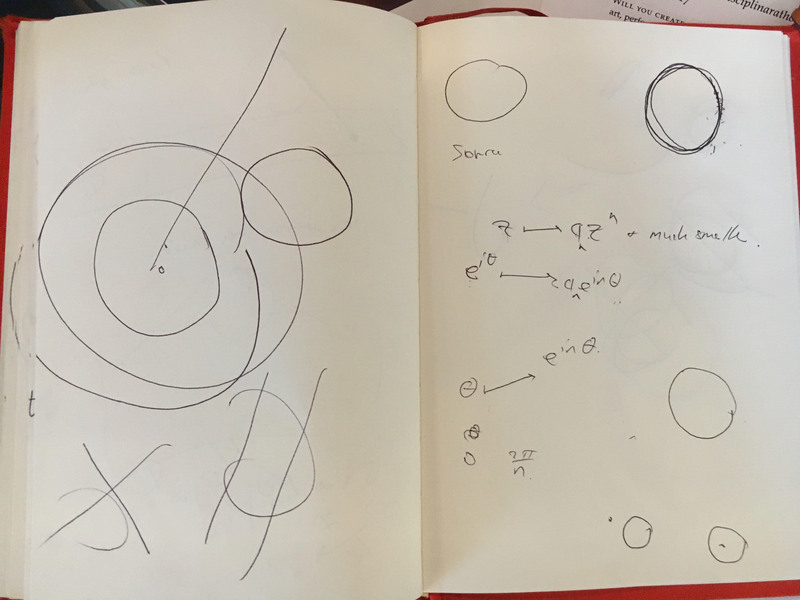 They included proposals of strange and fascinating ideas, a zine, a game, a children’s book, interactive experiences with the audience, sound-based art, lots of whiteboard drawing, and improvisational on-stage conversations. There was a special magic in knowing that each one of them had been put together by a pair of strangers in the last ninety minutes! Here are brief descriptions of each presentation. Each group had three minutes to present, but most groups went overtime, as expected. I'm writing these synopses a few weeks after the event, so all omissions and errors are mine. Some of the participants opted to remain anonymous, so their names are omitted. The first group, composed of Anna Seigal (a mathematics grad student) and Sara LaHue (a neurology resident) proposed to build an apparatus, using principles of information theory, to communicate with people who were suffering from locked-in syndrome or in a coma. Next, Molly Mackinlay (a teacher) and her partner (an immunology PhD candidate) proposed to tell teachers about a new approach to treating cancer. They were excited because there were many parallels between the technology used to find cancer cells and a method that could be used to teach teachers about it: "Insertion, Activation, Persistence, and Division." Teaching is like inserting ideas into the minds of people. It takes just one T-cell to create cure cancer, just like how it takes just one teacher to teach other teachers. May-Li Khoe (a designer and co-director of Khan Academy Long-Term Research) and Ben Reinhardt (an entrepreneur with deep learning expertise) pitched us a book proposal: they wanted to help people see in the ways that machines see, and alluded to the human adversarial examples making the rounds online. They then presented a mockup of a children’s book titled Computers are NOT people. It was a hand-drawn, pop-up, interactive book, with swing-out panels and pull tabs for computer and human views of, for example, a giraffe or a kangaroo. May-Li and Ben seemed interested in actually pitching the book to a publisher. Scott Farrar (a math teacher and researcher at Khan Academy Long-Term Research) and his partner (a game designer and programmer) presented a mockup of a game to help learners explore mathematical rules. For example, a learner might explore different arrangements of dominoes while learning combinatorics. They presented their idea by making slides out of paper and shuffling them to depicting various game states before and after player actions. They seemed particularly interested in inventive, non-standard rules: "the distributive property is not the only one worth exploring!" The next group, composed of a healthcare policy economist and a software engineer with expertise in distributed systems, talked about how they first struggled to find common ground, but eventually struck on a compelling idea. They proposed to apply the principles of distributed systems to create more resilient networks of healthcare clinics in rural areas and developing countries. For example, many of these clinics have data that many of the other clinics need: how can they share the data in a fair and robust way? This is a classic distributed systems problem. Additionally, clinics could be linked more intelligently such that an arbitrary half of connections could be disrupted without overall network damage, and clinics could store less data each. Lastly, they proposed to design an incentive structure such that clinics were inclined to make gifts of information, such as patient records, to each other. 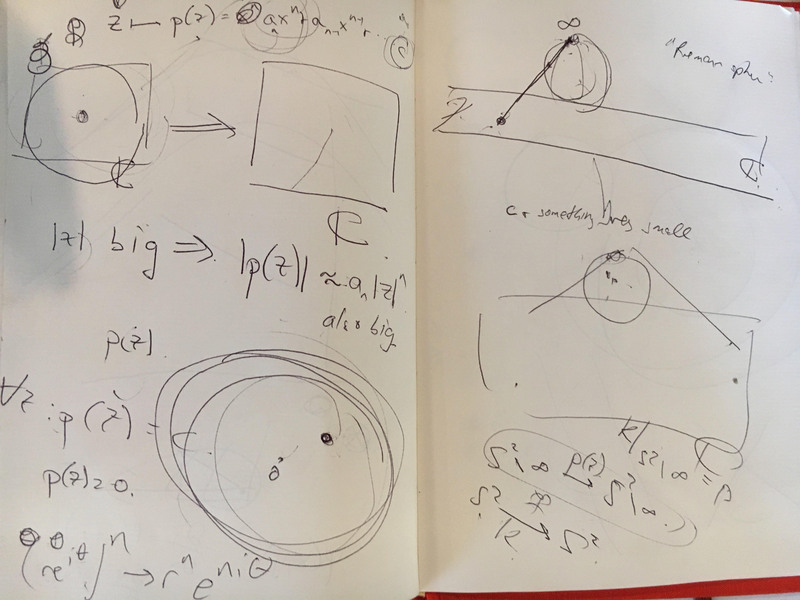 Andy Matuschak (a software engineer and co-director of Khan Academy Long-Term Research) and his partner (a math PhD candidate in topology) ended up leaving Topos and going out for dinner, over which they talked about his partner’s research in symplectic topology. Andy presented some process pictures, an "anthology of the conversation." 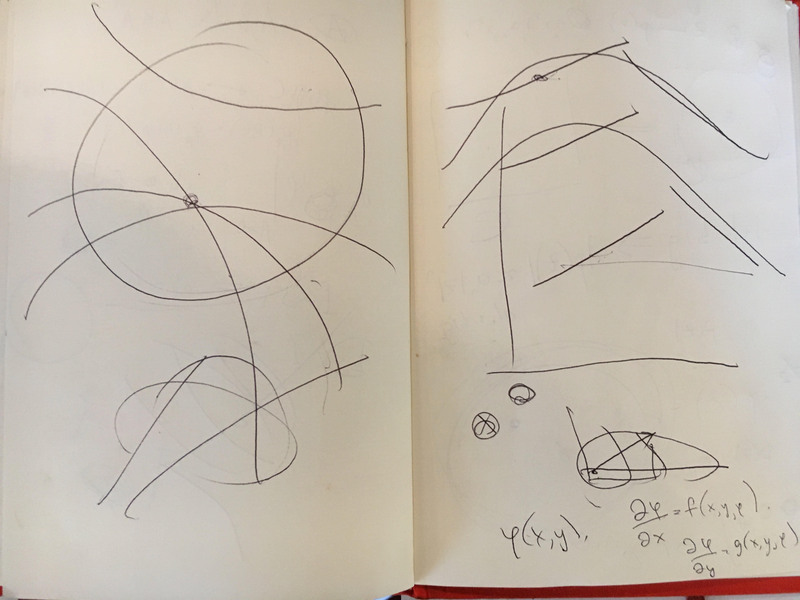 According to Andy, "the goal of the burrito... was for [my partner] to explain to me the modern concept of an algebraic structure." His partner’s topology research involved a lot of loops and "nonsense with symmetries" which nevertheless made for beautiful diagrams. Andy asked his partner one impromptu question on stage: "I feel like everything you showed me was several leaps of abstraction away from my understanding. What would I have to do to understand?" In answer, his partner told an anecdote: "Actually, the situation is the same for me and everyone in my field! Once, my advisor simply drew a loop on the board, punctuated by a line and a dot, and said: there… now you understand." The next group, composed of a bioengineering PhD student and an ethnomusicologist, proposed to create an app that would use machine learning to help people learn to play music. 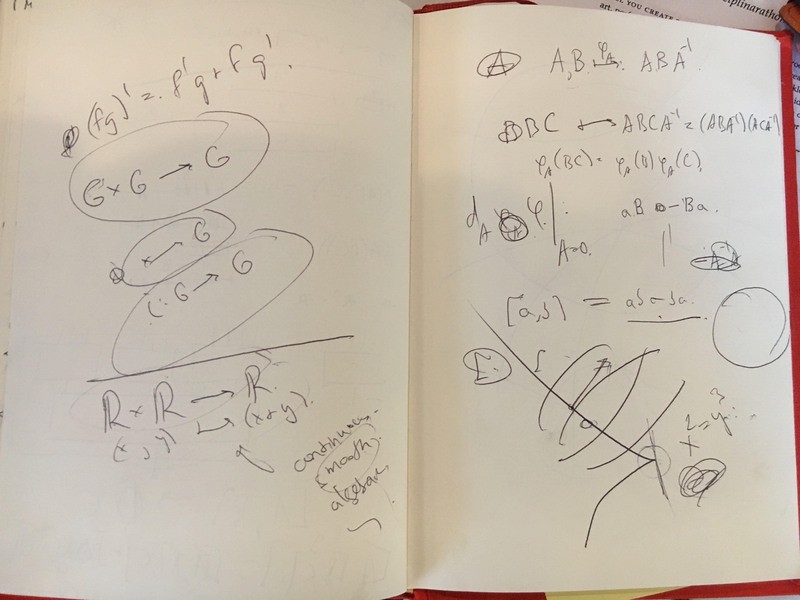 The latter person saw music learning as a complex pathfinding problem: the path is nonlinear, and there are an infinite number of ways to get from your state to the level of expertise you want. The former person had experience in using ML to detect cancer. Together, they wondered: could ML give the feedback you need to improve? For example, their app could listen to your quality of rhythm, tone, and singing, and give feedback on those aspects of your music. Dana Baddad (a designer) and her two groupmates (a postdoc working on human aging, and a PhD student in machine learning) started by presenting their conversation. Dana was interested in the idea of the "city as an interface," and stated that cities needed information about themselves so they could self-organize into a perfect city. The second person followed up on the idea of information: in a person’s body, each individual cell sends signals such as "death" or "glucose." The combination of individually meaningless signals gives rise to a meaningful one. The group proposed to make explicit the analogy between cities and bodies by installing physical interfaces throughout a city to collect emotional signals from people. These interfaces would comprise buttons and sliders with gradients of colors. For example, if you felt inspired, or angry, or scared, you would move the slider to let the city know. These interfaces would keep track of their inhabitants’ safety, mobility, health, inspiration, and community. Dana said, "People might feel some way at some time in a city, but not understand the source of that feeling. Our interfaces might surface surges of emotion before they manifested, for example in riots." Harvest Zhang (an aerial systems engineer and musician) and his partner (an archivist at Berkeley) started with some meta-commentary on the antidisciplinarathon. Events like these mostly live on in the participants’ memories. They are rarely archived, and any materials that survive are ephemeral notes scribbled by the participants, lost in the proverbial stacks. To stem the tide of obscurity, Harvest and his partner carried a microphone through the event during the collaboration sessions, capturing the energy of forty lively strangers in a big house all tossing ideas at each other. They spliced the result into a five-minute field recording that they played for all of us to hear. "it’s immersive, it’s in 3D, and it’s these weird shapes that don’t…"
"the way these rulesets are communicated…"
"so one example of that is someone who might be in a locked-in state…"
"you shouldn’t consider your goal to be careful articulation, it should just be…"
"...our thirty minutes are up." "Okay." "so it’s real feedback from, like, the entities you care about, okay…"
"but the most important thing is that it allows city planners to…"
"oh sure, they know what it is, so they must..."
"...to give them a rhythm." "So yeah, that’s one way..."
"I think it would be super cool if you did your anecdote about how just one T-cell is able to cure cancer..."
The next group of three, composed of a biophysics PhD student, a software engineer with machine learning expertise, and a PhD student in math, proposed to design a method for communicating with aliens. They agreed on starting with a sync pulse (which hopefully wouldn’t be mistaken for a pulsar), then wanted to follow up by sending more "unnatural" things that listeners wouldn’t mistake for natural phenomena. One might try and establish a vocabulary for one’s language, or transmit the periodic table by encoding information in the electrons in atoms. In this way, one might be able to to build up all of biology. Xiaohan Zhang (a software engineer interested in music) and his partner (also a software engineer interested in music) created an interactive musical experience. First, they asked everyone to point their phones to the IP address 192.168.11.66:8000. Slowly, a chaotic squealing noise started to fill the living room: everyone’s phone had become a theremin. Each phone’s screen emitted a note, whose name and frequency was described on screen, accompanied by a bright color mapping to each note. Tilting your phone at different angles would change the pitch of the note. You can turn your own phone into a theremin here: sound on. Xiaohan and his partner then pulled up the sheet music to "Mary Had a Little Lamb" and asked us to all sing it with both our phones and our voices, which we did slowly, joined halfway by Sebastien’s accompaniment on the piano. Aaron Slipper (an undergrad in mathematics) and his partner (a software engineer with expertise in Classical Chinese literature) presented a game of guess-the-quote, parceling out three clues to the audience. The two of them were very interested in exploring one theme: How do we find signal among noise? Aaron also described how his family played a game in which one would read out the first half of a quote from Bartlett’s Book of Quotations, and each player would try to come up with a second half that would pass for Bartlett-worthy. Thus, the audience’s task was to complete the second half of a quote from Classical Chinese literature. "Only in the cold and snowy winter does the pine stand taller than the cypress." "Only in the cold and snowy winter do you cover the baby pine tree or whatever." "Only in the cold and snowy winter can orthonormal bases be constructed." Matvei Khoroshki (a PhD student in biophysics) and his partner (a hardware engineer at Google X) described how they were worried that they would lose funding for their work due to recent political actions, so they wanted to propose a radical new system of government. However, they decided against it because "overthrowing the government is a bad hackathon project." Instead, they proposed a meta-variation of their idea: model organisms are often used in biology to test hypotheses about their behavior and workings. So, how would one create model organisms to test public policy and predict better policies? The next group, composed of a researcher at Y Combinator Research and an MD-PhD student in biology who was also a dancer, proposed to create a theme park for science. The first person wondered how one could bring the visceral experience of dancing to understanding science, and the second person was interested in sparking kids’ interest in science. Thus, the theme park would include different attractions for different sub-areas of STEM and their intersections: thrill rides to illustrate physics, human-sized surfaces and optimization landscapes to clamber on for math, a Westworld clone for the intersection of biology and computer science. Inspired by the Hunger Games, they thought it would create a more authentic, intense learning experience to trap kids in the theme park and force them to escape life-threatening challenges using the power of science. For example, a kid might be chased by a crowd of spiders toward a cliff, and have to use a provided catapult to escape. "If you don’t figure out how projectile mechanics works, you won’t be able to survive." To illustrate a more abstract idea, they also imagined a giant field out of which spikes would emerge at random intervals, correlated with the growth of flowers in the field. To cross the field, a kid would really need to understand linear regression. M Eifler (an artist and VR researcher) and their partner (a lawyer-turned-programmer) presented a zine they made titled "How to win every argument." For example, you could utterly dominate the opposition by learning to see their point of view and asking them clarifying questions. Each page of their zine described and illustrated a different rhetorical hammer. The last group, composed of a painter (with an economics background) and a mechanical engineer interested in political science, struck on a common interest in media art. They thought that existing work in media art would be strengthened with a better understanding of the canon of "art grandmasters," so they presented a series of politically-charged images juxtaposed with canonical texts. Their presentation was titled "Homages → Homage" and can be found here. 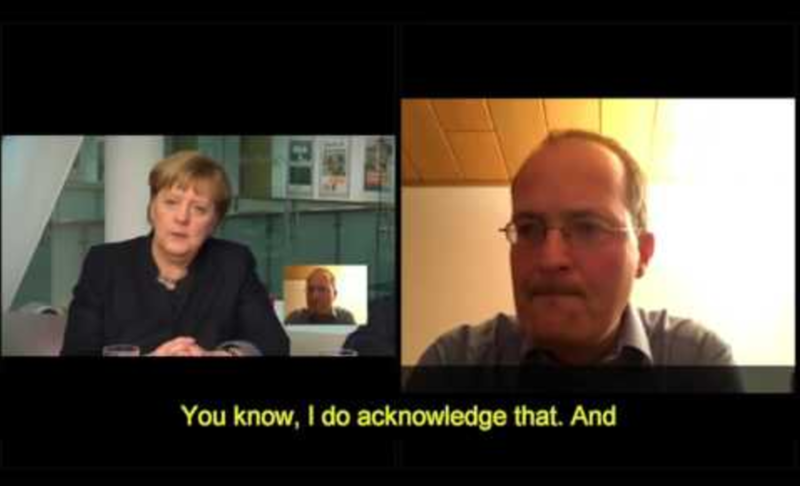 They put The Prince in dialogue with a video of Angela Merkel, Leviathan with the neo-Nazi riot in Charlottesville, Matisse with Peter Thiel, Han Feizi with a video of Trump, "art for art’s sake" with neo-Nazi AirBnB closings, and closed with a quote from Why Contemporary Art Matters Now: "I know that the 'news,' the light version of communication, is like sand in an hourglass, the essence of which is simply to be noticed and not to be pondered or understood." Afterward, folks lingered for a few hours at Topos, often following up with other participants about presentations or ideas they found intriguing. I hope some of our ideas and experiences will linger on—in people’s thoughts or in people’s work—for years. The general structure of the event worked quite well. I suspect we could hold the same event with the same participants, just grouped differently, and people would still produce great work. And I believe our general vision is sound. I’ll leave it to the participants and readers to decide whether we succeeded. In the future, how can we improve the structure of the event to better achieve this vision? There are many axes of creative work and research worth exploring. Do we aim for radically antidisciplinary work? The wider the divide, the longer it takes participants to negotiate a common language, and the riskier it is that their work is "shallow" instead of "deep." Perhaps we ought to ask folks to also present their common language. How broadly do you define a discipline? Even participants within the single discipline of computer science might not speak the same language. An researcher in human-computer interaction might have a hard time communicating with a game theorist. Does the spirit of the antidisciplinarathon lie in the antidisciplinar- or in the -athon? That is, ought it to focus more closely on pushing research boundaries or on bold artistic collaboration? Matt Might's illustrated guide to a Ph.D. depicts research progress as a tiny dent in the frontier of human knowledge. 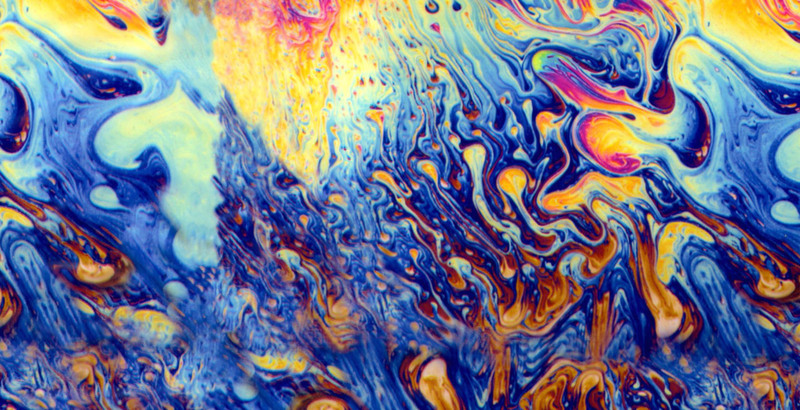 In relation to research, I see great art as work that slightly shifts and colors our understanding of human knowledge. Can one do both, perhaps in the form of art-based research? Here's another variation. Our event was extrinsic because we encouraged participants to produce things, implicitly to change the world around them. Might we run an intrinsic event where participants are encouraged to change themselves? People who are working in very different disciplines might find they think very similarly; people who are working in the same disciplines might find they think very differently. A theorist working in physics might differ more from an experimentalist in physics than from a theorist working in, say, architecture. Can we vary the event so people are encouraged to understand and use someone else’s perspective and mental toolbox? Here are some concrete suggestions for vantidisciplinariations. We thought pairing mattered a huge amount. In practice, pairing could matter a huge amount or not at all. To find out, you could experiment with the pre-event survey and the pairing strategy. You could match folks randomly and tell them they had been carefully matched, or you could carefully match folks and tell them they had been randomly matched. You could even try these two pairing strategies on two different halves of your attendees. We handed out a prompt encouraging specific types of work, and were relatively hands-off with facilitating conversations. You might encourage different types of work on your prompt, or steer conversations more actively. We decided to have folks work together for ninety minutes. You could encourage greater depth by holding an event over, say, multiple days. One of our participants, an ethnomusicologist, commented that he runs a similar event where musicians jam with partners over a week and produce a collective EP by the end. Finally, part of the reason I’ve written up this event in detail is so it can serve as a blueprint for you to hold your own antidisciplinarathon! (Hopefully with a more pronounceable name!) If you do, I'd love to know—please get in touch. Thanks to Lea Albaugh for introducing me to the term "antidisciplinary." And thanks again to the residents of Topos for everything. 1 I've long been frustrated by the inefficient structure of conferences. Gather hundreds or thousands of interesting and skilled folks, then ask them to direct all their attention at a sage-on-a-stage who may not have earned all that attention. (I say this as someone who has been a sage-on-a-stage.) These attendees have so much to offer each other, and they realize this, hence the rise of the informal "hallway track." But it’s difficult to break out of the circles of friends and friends-of-friends and meet someone new, let alone get to know them deeply, let alone meet someone with complementary interests. All that is left to chance. I’ve found that the best way to get to know someone well is to start with a small collaboration. So, I wondered if one could turn the conference model inside out: organize most of the conference as a centrally-planned "hallway track," with participants presenting the results of their focused conversation-become-collaborations. As I mentioned in the introduction, here is the lightly edited text of the email conversation I had with Robert Ochshorn and Michael Nielsen about the premise of antidisciplinary work. In fact, I think this analogy is rather garbage. The underlying narrative of untapped opportunity in the "massive amounts" of space outside of the disciplines seems to reflect an investment background more than signaling genuine epistemological breakthrough. As I see it, a scientific discipline must combine a perspective with a methodology. So for example a chemist may see the world through its atoms and their properties, armed with techniques to probe for these atoms and to reason about their consequences. How and where to "atomize" is an essential question that must be answered by a discipline, but the analogy is muddled because atomization is exactly the act of rendering discrete, so there cannot be a continuous space to pick from at will. Suggesting that you can assume any point in the near-blank page of human inquiry and suddenly gain a new empirical toolset is as absurd as the (too often viable) Silicon Valley elevator pitches that surely inform the analogy ("Uber for cats!," "Tinder for hydro-fracking!," "AirBNB for your conscience!," etc). Despite this critique I do think that the "antidisciplinary" name and organizational gesture are exciting. For there is also the Foucaultian reading of discipline ("and punish"), comprising institutional forces that protect the status quo, that render the sciences in the service of power, that canonize and mythologize foundational stories and persons, that credentialize and Taylorize the pedagogy. I think antidisciplinarianism is also hinting at a space outside of the institution and authorities of science, and I believe there really are vital sources of knowledge that are allergic to institutions and bosses and conventions. Update: One of our faculty members pointed out that disciplines are more like broad swaths and that a lot of the most cited papers are the ones in the disruptive "antidisciplinary" spaces. I subscribe slightly more to the swath theory. 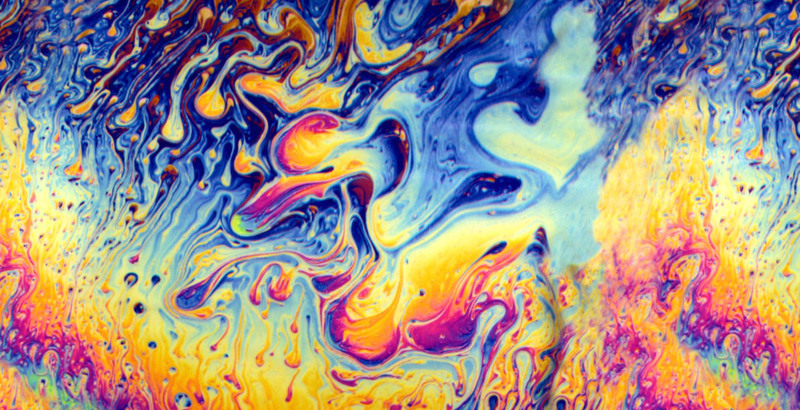 It seems likely that "disciplines" being colorful amorphous blobs lying on a flat surface covering different spaces like a psychedelic Venn diagram is a closer model. But picking work that just lies "at the intersection of X and Y" seems boring. It's like work in programming languages that just tries to make "a programming language for Y." I'm allergic to the word "interdisciplinary" (versus "antidisciplinary") for the same reason. In the event RSVP form, I asked participants to "bring their hammers and their nails to the event," which I hope at least gives more focus to the event than "throw a dart at the white space and hope you strike bullseye." I hope that comes slightly closer to the "combining a perspective with a methodology" model of progress that you suggest. Perhaps I should have asked folks to try and explicitly identify their perspectives and their methodologies, and bring that. On interdisciplinary and anti-disciplinary: something bugs me about both ID and AD work: many people who advocate for it don’t seem to understand very well the reasons we have disciplines. There’s often an implicit attitude that they’re largely the result of a brief fashion or political alliance. Fashion and politics do play an important part. But in the disciplines I know well, the origin was always some deep set of insights. Maxwell’s equations, evolution by natural selection, the Church-Turing principle, even humble back propagation, the central dogma of molecular biology, etc. [My sense is that this may be true in parts of the art world, too, though I lack the expertise to be sure.] Such insights are the core around which a coalition then forms, exploring and developing those ideas further. And so the location of the disciplines isn’t just an arbitrary choice by politically powerful figures. Without Maxwell’s equations, or something similarly deep, we wouldn’t have a field of electromagnetism, no matter how many powerful figures lobbied for it. Lots of inter-disciplinary and anti-disciplinary work is done by people who’ve never mastered a single discipline based around such a set of insights. And the resulting work is often rather tepid, I think because they’ve never mastered one (or more) deep ways of knowing.